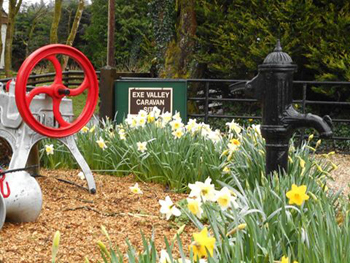 Welcome to Exe Valley. If you come in the Spring there is an abundance of daffodils. 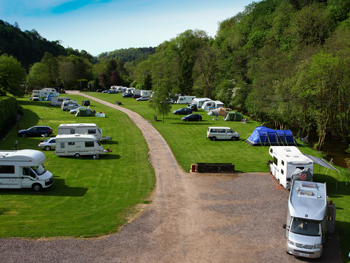 Looking back down the valley, all the pitches are beside the River Exe on one side and beside the Millstream on the other. 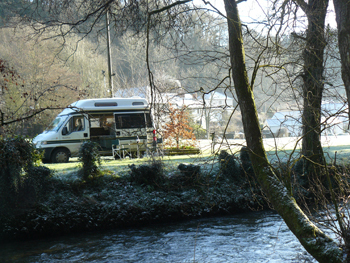 View from the opposite bank of the river with Bridgetowm Mill and the campsite shower block in the background. Our dog exercise area beside the River Exe. 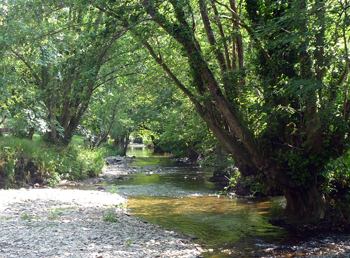 The river supports Brown Trout and Grayling throughout the year. 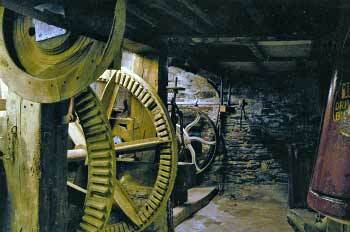 The 17th Century Mill has been well preserved, many of the working parts are in place or on display at the entrance to the campsite. 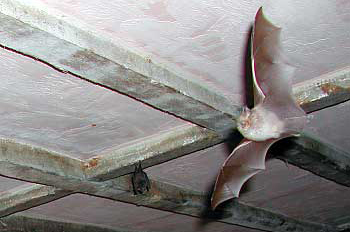 The old building is honoured to have Pipistrelle, Brown Long-eared and Lesser Horseshoe Bats in its loft. 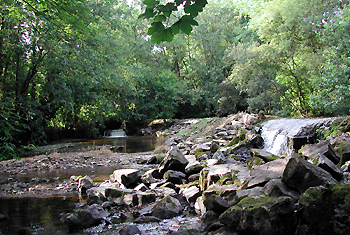 There is a pleasant walk within our site, going past the Fir Tree Plantation, to sit and watch the water cascading over the Weir and down the Salmon Leap. Yes, the Salmon and Trout can be seen leaping in late summer and autumn. 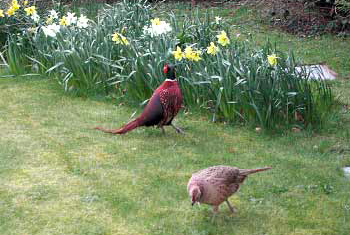 Birds are in abundance with Kingfishers, Dippers, Herons and Pheasants making regular appearances. 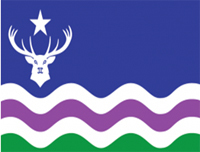 Campers have observed from their caravans the Red Deer drinking from the Exe early in the mornings. The beautiful planting of decorative trees, shrubs and confers blend in with the natural wild flowers and deciduous self sown trees along the river banks. 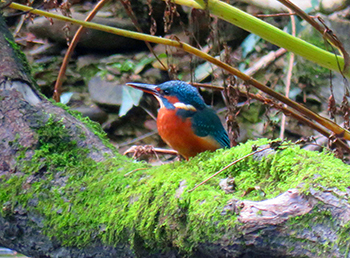 This photograph of a Kingfisher was taken by Tom and Marie Robertson from their pitch. 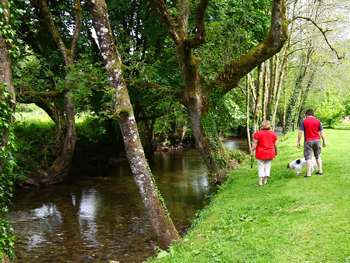 Surrounding the campsite, which is within the National Park, you have the beauty of Exmoor. 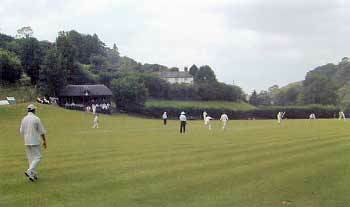 Several walks start from the campsite, take a guided Safari Trip on the moors, or watch a game of cricket at the beautiful Bridgetown Cricket Ground. 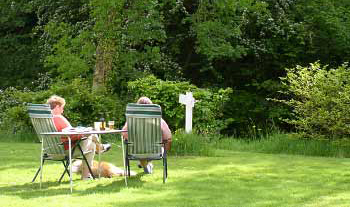 For just relaxation you can cast your fishing line from your pitch and look out for all the wildlife around.